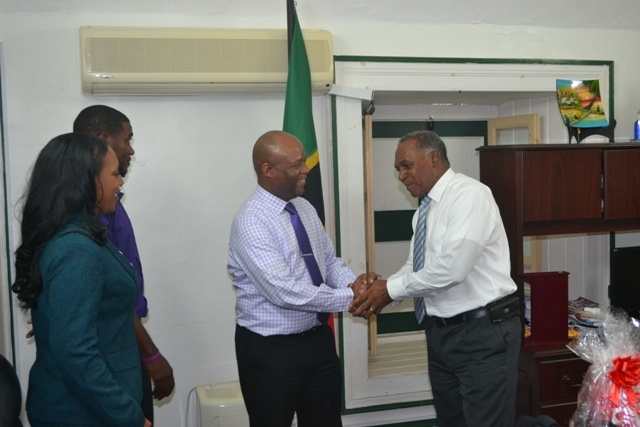 NIA CHARLESTOWN (MARCH 09, 2016) — Premier of Nevis Hon. Vance Amory was presented with a Digicel gift package including a 24 inch television set and free cable for his office at Bath Hotel on March 09, 2016. The gift was handed over by Sean Latty Chief Executive Officer (CEO) of Digicel (St. Kitts-Nevis) Ltd. on behalf Digicel Play formally known as Caribbean Cable Caribbean Communications. According to Mr. Latty, the contribution was in an effort to raise awareness of the product of Digicel Play and also to enable the Premier to keep abreast of matters of international interest while at his office. In response, Mr. Amory thanked the Digicel CEO for his contribution and said the gift would keep him informed of matters unfolding on the world stage which could impact Nevis. Also present were Jacinth Welsh Business Sales Manager for Digicel (St. Kitts-Nevis) Ltd., who made the presentation to the Premier and Juan Christmas Digicel Play’s Employee of the Month for February. Both Mr. Amory and Mr. Latty used the opportunity to congratulate Christmas and encouraged him to continue to be exemplary in his duties and to use the confidence of his peers who selected him as a motivation.